Sit back and relax as you travel into the amazing Uluru – Kata Tjuta National Park. Your Driver Guide will provide details of the afternoon’s itinerary while you enjoy the amazing surrounds and incredible sight of Uluru in the distance. As you head toward the iconic Uluru, you’ll take in the sites of Kata Tjuta, also known as the Olgas. This incredible formation of rock domes extends six kilometres into the ground and is the remains of erosion that began more than 500 million years ago. It is understood that Aboriginal people have lived in this area for 22,000 years. Once you’re settled at the Sunset Viewing area, you’ll be served from a selection of Australian wines and nibbles while you begin to absorb the beauty of your surroundings. You can just relax or stroll around the Sunset Viewing Area to discover your own personal space to watch the amazing sunset. Arguably Australia’s most recognisable and fascinating icon, Uluru (Ayers Rock) stands 348 metres high, however, most of its mass is below ground level. You’ll be overwhelmed by its incredible size, presence and inherent spirituality. As the sun sets over the western horizon you’ll be witness to the majestic presence and many shades of colour for which Uluru is most famous. 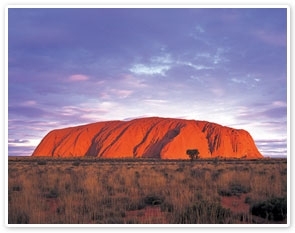 Be sure to have your Driver Guide take a photo of you with Uluru – although the memory alone will stay with you forever! The entry fee is valid for 3 consecutive days and may change without notice. La preghiamo di notare: questo prodotto è su richiesta. confermeremo la disponibilità nel più breve tempo possibile dopo aver ricevuto il suo ordine.